The Grapeland High School Theatre Department rehearses recently for their one-act play “Home on the Morning Train.” A free community performance will be held at 3 p.m. Sunday, March 5. The one-act play cast and crew will compete in district competition later this month. Courtesy Photo. Grapeland High School Theatre Department will give a community performance of their one-act play “Home on the Morning Train” at 3 p.m. Sunday, March 5. “The play is set in 1939 Germany and also in 1839 in Alabama. It shows Jewish children trying to escape the Holocaust reading a book about runaway slaves in the Underground Railroad. 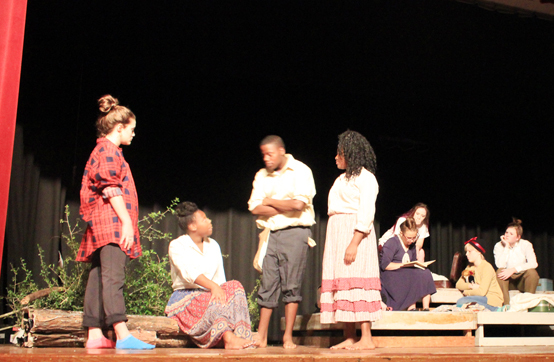 They are inspired by the runaway slaves,” GHS Theater Arts and Art Teacher Callie Barge told the Messenger Monday. Twelve students will be featured in the one-act play, written by Kim Hines. “The kids have put a lot into it and with their busy schedules being involved in lots of things, it’s good to have support from the community. It will encourage them for the district contest,” Barge said. The GHS One-Act Play cast and crew will compete in the district competition on March 10 in Centerville. The top three districts will move on to the next level, bi-district. “Last year we went to bi-district and we are hoping to do that again this year,” Barge said. Assistant Director D’Linda Mahaffey saw the play when she was younger and thought it would be a good fit for the theatre department, Barge said. The cast includes: Runaway Jessie, D’Angelo Colter; Rifka, Sayler LeBlanc; Brave Mary, Aaliyah Sims; Aaron, Cara Castillo; Katie-Mae, Lynisha Woods; Baruch, Reagan Bishop; Ledah, Rebecca Seiersen; Kindred, Haylee Cryer; David, Carly Parker; Karl, James Hobson; Adelaide, Abigail Barrett; and Olivia, Janassiah Creag. Admission to the community performance is free, but donations for the program will be accepted.